Speech writing is a very complicated process as it requires a writer to involve not only creativity but to also to make sure that the information is understandable. Speech writing can pursue different purposes. However, in most cases, speeches are persuasive pieces aimed at convincing the audience that the words one says are true and the only possible. Writing a persuasive speech does not start with a pen in one’s hand. 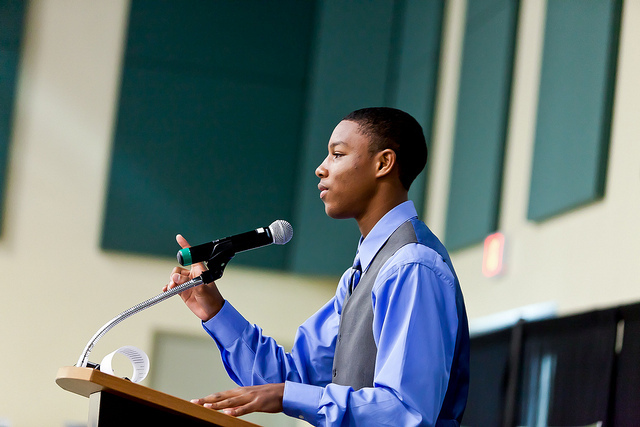 If you want to write a speech and to make sure that it convinces the audience, you need to conduct a research. Here is a list of steps you need to follow in order to complete you persuasive speech writing successfully. You need to know what specific theme you are going to discuss. Each speech should cover one particular aspect, it should have one direction. Even the presidents in their speeches try to follow one specific topic despite the fact that all spheres of human life are involved. Therefore, the choice of the topic should be the first step in your writing plan. You have to understand what particular audience your persuasive speech should be directed to. It is important to know the interests of the audience, their needs and desires. At this stage you may want to correct your topic, this is OK. Your topic should raise interest in the audience. You need to create a list of the words, which will attract the attention of the audience and will be understandable. You need to know that speaking about information technologies to simple people, you should not use specific terms. Also, talking to the layers, you are to refer to particular terminology to make them trust you. People should see that you know what you are speaking about. You should make a trial speech. It will be great if you can find several people from the auditory you are going to refer your speech to and try it. If you will manage to impress them, your speech is ready. Finally, you need to gather all the possible questions which may rise among people and make sure you have the answers. Overall, writing a speech which can convince the audience is a very complicated and durative process. It’s not enough just to take a pen and to write an essay on a topic. You are to understand the needs of the audience and to choose the correct words.